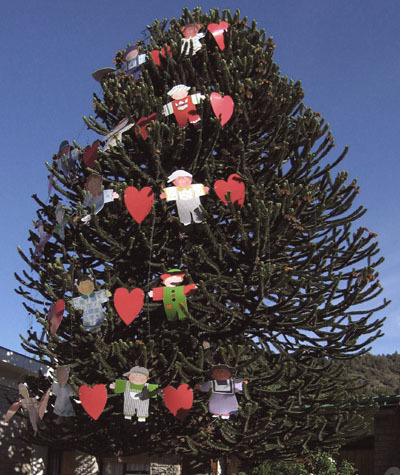 It's the Christmas season, and you may have been expecting a choice small Alpine 'Plant of the Month'. However we're running short of material, and need contributions from you, the members - please contact me if you have a favourite plant that you would like to immortalise with a short article on the Group website. Meantime, here's something different. 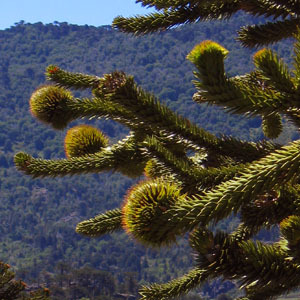 Araucaria is often known as 'Chile Pine', but isn't a pine. 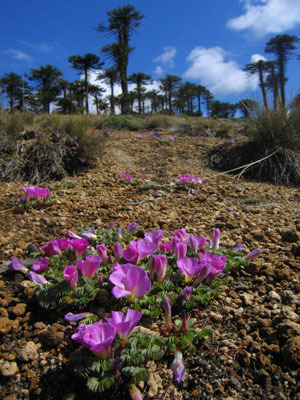 Araucariacea are, like Pinaceae, one of the (about) eight families making up the Coniferae. Araucariacea include the Aurucaria as well as other southern hemisphere conifers including Wollemia, [this was just discovered in 1994 and you can see a rare specimen in the National Botanic Gardens in Dublin]. Araucaria was named after the Araucaria native South Americans who live in southern Argentina and Chile ( and who don't like this name given to them by the Spanish, and prefer to be called Mapuche). Araucaria araucana grow in this area, where we saw mountain forests of them during our 2005 visit to Patagonia. This one of course was urbanised, in San Martin, and has the 'specimen tree' habit that we see in arboreta here. In nature, however the trees look much more untidy, with branches broken by winter snowfall. The picture on the right shows the trees in a natural setting at Pino Hachada pass in Argentina. 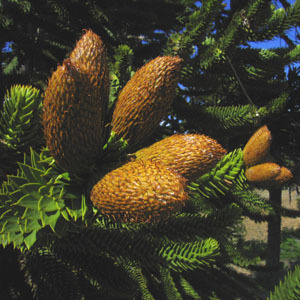 Below are the female and male forms of Araucaria flowers.